The Daily Image today over at ASTRON is this wonderful high resolution radio image of the extragalactic source 3C61.1. 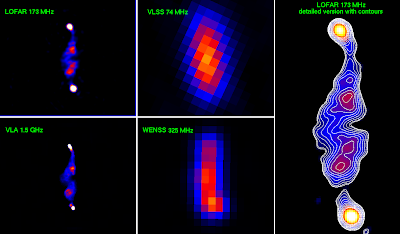 The image compares the LOFAR result at 173 MHz (1.7m), with images from other recent radio surveys. Most directly comparable are the results at low frequencies from the VLSS survey (which used the Very Large Array in New Mexico) and the WENSS survey (which used the Westerbork Synthesis Telecope in the Netherlands). The VLA image at 1.5 GHz (20cm) comes from radio waves 10 times higher in frequency (or 10 times shorter in wavelength) than the LOFAR image, so the comparable resolution of these two images is a really impressive feat. The resolution (or sharpness) of an image is set by both to the size of the telescope (or in this case array of telescopes) and the wavelength of the light (or radio waves). The bigger the difference in size between your telescope and the wavelength you are detecting, then better the resolution you can get. This is why in radio astronomy, where we have very long wavelengths to deal with we must build very massive arrays to get anything like the resolution a "classic" telescope can achieve for optical light. So the fact that the resolution of the LOFAR image and the VLA image look similar says immediately that the LOFAR array must be spread 10 times wider than the VLA. Pretty impressive! This result which used 20 LOFAR HBA (high band antenna) stations (16 in the core, and 4 remote stations) for a 60 hour observation is a wonderful teaser of the amazing images we can expect when the full LOFAR array is functioning. And remember, the LOFAR-UK station at Chilbolton will add a lot to the resolution which can be achieved by LOFAR, being one of the most distant stations from the Dutch core.